Railpictures.ca - Doug Page, Bruce Acheson collection Photo: In the late 1960s and early 1970s, Canadian Pacific had a large leased fleet which included F7s from the Baltimore and Ohio and SDs from the Duluth, Missabe and Iron Range (as well as units from the Boston & Maine and Precision National). Here we see three leased units outside of the shop building at Toronto yard in late winter 1972. | Railpictures.ca – Canadian Railway Photography – photographie ferroviaire Canadienne. Copyright Notice: This image ©Doug Page, Bruce Acheson collection all rights reserved. 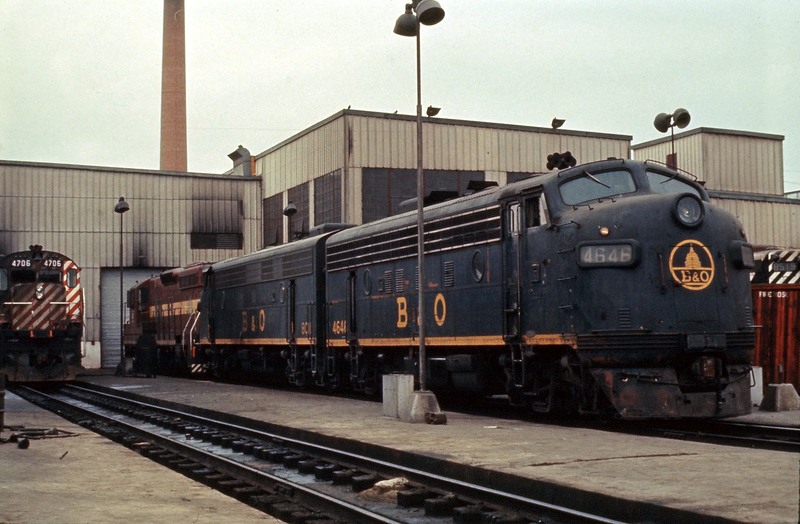 Caption: In the late 1960s and early 1970s, Canadian Pacific had a large leased fleet which included F7s from the Baltimore and Ohio and SDs from the Duluth, Missabe and Iron Range (as well as units from the Boston & Maine and Precision National). Here we see three leased units outside of the shop building at Toronto yard in late winter 1972. B&O 4646 is the former B&LE 703A (acquired in 1962). The way you can tell original B&O’s from these 2nd-hand cab units, other than the flakes of orange showing through, is the lack of nose MU capability. The 8011 behind it is also 2nd-hand, exC&O, and is an FP7A. And then there’s the SD9……three of EMDs finest ! !